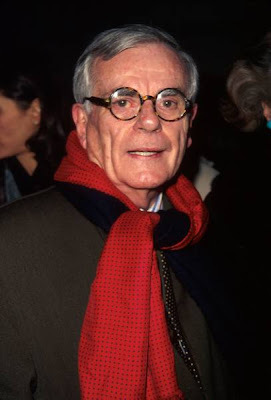 My first stop when finding a Vanity Fair in my mailbox was to see what Dominick Dunne was up to. He was the quintessential outsiders, insider. His own story reads very much like the fiction he wrote. In 1964, Dunne and his wife, Lenny, threw a lavish black and white ball to celebrate a decade of marriage. One of the guests was Truman Capote. Two years later, Capote replicated the idea for his famous black & white ball. He did not invite the Dunnes! Finding himself on hard times, Dunne once sold everything he owned, including his dog. I am rather fond of this image from Life, the way I will remember him, jaunty and inquisitive.